Comet 73P/Schwassman-Wachmann 3 image from taken from May 4 to 6 shows at least distinct 36 fragments. Comet 73P/Schwassman-Wachmann 3, or just SW-3, began fracturing in 1995. The breakup has accelerated in recent weeks as the comet again approaches the Sun, as it does every 5.3 years. 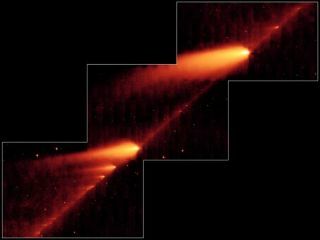 On each orbit around the Sun, the comet lays down a new debris stream along a slightly different path. Each stream spreads out over time. When Earth passes near the comet's dusty trails every year, bits of debris burns up in our atmosphere, creating a minor meteor shower called the Tau Herculids. "But the door's open," Reach said in a telephone interview.